I'm not sure about where you guys are, but here the weather is starting to cool down. And for some people, that means drinking less white wine and breaking out more of the dark reds. I can see how that may seem to fit since heavier food is more fitting for cold weather, but unfortunately you'd be missing out on some great white wines! 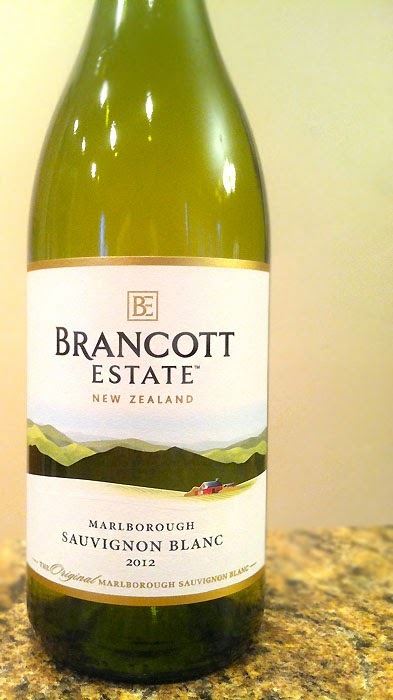 The 2012 Vintage Brancott Estate Sauvignon Blanc pours a very clear, pale gold color and has aromas of pineapple, apricot, and lemongrass. Tasting brings a wonderful mix of lemon, grapefruit, and lemon zest, followed by a slight lingering taste of cilantro in the finish. All in all, perfectly crisp and bright without being overly sweet. This would go ridiculously well with some citrus-y fish tacos. Or it could be had on its own and be a great refreshing sip on, yes, a hot day laying out in the sun. But like I said at the beginning, I've also had nice refreshing wines like this on a day where I'm watching the snow fall lightly outside my window, which almost seems to parallel the weather in its briskness. Drink This: if you want a perfectly crisp, refreshing, citrus-y white wine. One of the better white wines I've had in the past few months. A steal at under $15. Don't Drink This: if you are looking for a heavier, white wine. Speaking of white wine in cold weather, even though it's a bit early, check out the live version of Tim Minchin's Christmas song "White Wine in the Sun." Pretty much my favorite Christmas song, even though it's not really a Christmas song. Which makes no sense, but actually does if you listen to the song.